St. Norbert College proudly opens Les Miserables this week with a 10 performance run from July 18th – July 28th. By far, “Les Mis” has been one of the most successful live musicals produced around the world, since its beginning in 1985. It has been performed in 42 countries and seen by 65 million people. You’re finally released and start a new life under a second identity. A local policeman (Javert) hunts you down for years since the real “you” has disappeared and isn’t checking in with your parole officer. St. Norbert College’s musical theatre program is definitely a cut above. Do not compare it with your average community theatre. The program’s professional name is “Music Theatre,” which has entertained and enlightened more than half-a-million people since 1962. 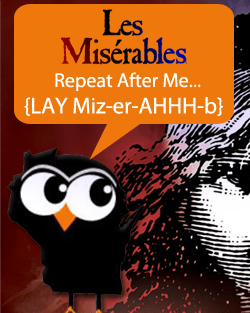 Les Mis is directed by Jim P. Birder, and the music director is Green Bay’s famous “Music Man” Dudley Birder. The cast includes musical performers from Sturgeon Bay to Appleton. A record 159 people auditioned. That’s saying something. According to local news anchor Kasey Hott, who plays Fantine, Dudley Birder himself has wanted to do this show for more than 20 years. St. Norbert has been trying to secure the rights to Les Miserables for a long time. Go celebrate with them by attending and applauding their efforts. Oh yes. It’s here. With the first prototypes used in the early 1600s, this circular, mechanical platform design has become a hallmark of almost every professional production of Les Miserables. 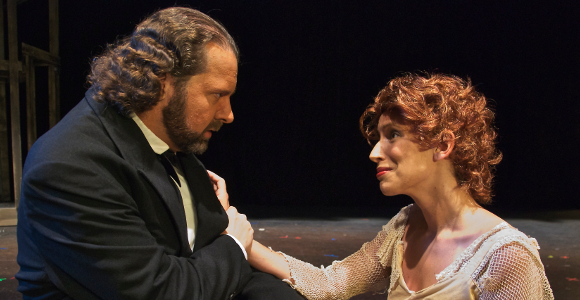 How could you not support a historical staple of musical theatre, right here in our backyard? St. Norbert College estimates that about 4,000 of your friends and neighbors in the Northeast Wisconsin area have volunteered to make these shows a reality since 1962. At either $34 or $38 a ticket, this show is a steal. If you look at touring prices for Les Mis across the country right now, tickets range from $68 to $273. Why add on travel expenses to see it when you can support a local college and regional performers for less? Besides, you never know when one of these local performers might take off, appearing in the next segment of WhooNEW’s 40 famous people from Wisconsin. You’ll get to say that you saw them before they were cool, which we all know is better than seeing someone once they actually become cool. Bragging rights! Oh, the songs. They are one of the main reasons that people can’t get enough of this show. Since the show is “sung through” (no spoken words, only sung), the multi-faceted songs truly carry you through the many storylines that are woven together. It has everything from triumphant war anthems, unrequited love songs, crazy melodies (think ‘Master of the House’ – George Costanza was right – it does get stuck in your head), hymns of regret and forgiveness, and of course, a heart wrenching chorus for the finale. St. Norbert College is nestled on the banks of the Fox River, right next to the beautiful Claude Allouez Bridge. Go grab a slice at Bilotti’s Pizza or The Black Boot on Broadway in East De Pere, and take a sunset walk over the bridge before showtime. Afterward, grab a drink at The Abbey or Nicky’s Lionhead Tavern, and discuss with your friends which character you hated more: the misunderstood villain, Javert, or the Thenardiers (the couple who severely abused Cosette, the famous face of the Les Mis posters). There is not one show I know of where you cannot walk away with something to chew on (and I’m not talking about your dinner leftovers). In this large cast, I would be surprised if you didn’t walk away identifying with at least one character. This musical really does have “something for everyone.” A country on the brink of revolution, and young men leading the charge for their cause. A convict on the run, risking his life over and over in the name of freedom. A painful love triangle. A man blinded by a desire to be righteous, convinced he was doing God’s work. A poor woman, unable to support her daughter, has to make the painful decision to give her up. It is a combination of all of these stories (and more) which make this musical tangible and real to all types of people. 10. Do yourself a favor and see it live. It’s better than the movie. While I had fun watching the Hollywood version of Les Mis this past New Year’s Eve (listening to the final note of the finale at the stroke of midnight did produce a tear or two), I have to admit that the live version is undeniably better. There is something about seeing raw emotion (and all those rotten teeth – yecch) up close and personal that a movie screen just can’t capture. Tickets are available for purchase by calling the SNC box office at 920-403-3950 or by ordering online at www.snc.edu/tickets. You can email them with questions at tickets@snc.edu. Thank you Jamie, a great article – and perfectly said! Thanks for the props, Mike! Glad you enjoyed it.